Juicing allows you to consume fruits and vegetables in their purest form. The juicer separates the pulp from the juice of each fruit and vegetable. Carrot, celery, apple, beet, ginger cocktail. As fear mounts over the quick spread of swine flu, it’s even more important that we take the month of May to do our RAW cleanse and build up our immune system. I am a strong believer, as is the founder of the natural health college where I studied holistic nutrition, (Clayton College of Natural Heath, www.ccnh.edu), that the body can maintain wellness or heal itself if presented with the correct environment – proper nutrition, clean water, fresh air, in short, a healthful “terrain”. Louis Pasteur once said, “I have been wrong. The germ is nothing. The “terrain” is everything.” The goal of this blog is to help you create that healthful environment which will allow you prevent or recover from an illness and help you to achieve remarkable health. Any healthful food regimen should include juicing fresh fruits and vegetables. You can do this at home with a juicer or go to the many juice bars across the country. Grocery stores like Whole Foods and many smaller natural food stores make fresh juice. Just make sure you know what’s in it. Some chain juice bars serve drinks loaded with dairy and sugar. • They contain important vital enzymes (if not pasteurized). • Juices help make our body alkaline which helps prevent the loss of essential minerals. • Juicing allows you to consume more fruits and vegetables making it possible to get sufficient quantities of vitamins and minerals from food. 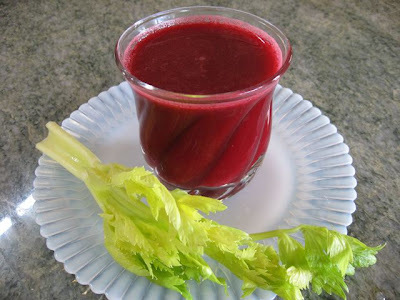 • Vitamins and minerals from fresh juices assimilate quickly. • Juice contains thousands of phytochemicals which can prevent illness and promote health. • Fresh juice with its phytochemicals, vitamins and minerals boost the immune system and accelerate the body’s cleansing process. • Green juices have chlorophyll which helps detoxify our bodies. Chlorophyll has a similar molecular structure as hemoglobin which carries oxygen throughout our bodies. • It’s a great way to use up bumper crops from your garden (here’s hoping!). Use organic fruits and vegetables whenever possible. Cut the tops off the carrots and beets. 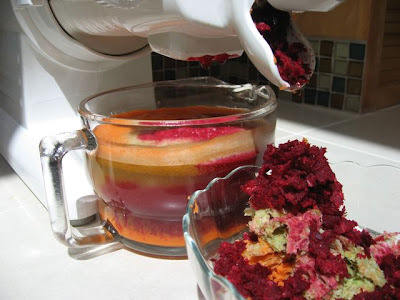 Cut beets and apples into pieces that fit through the juicer. Juice and enjoy! Per serving: 121 calories, zero g fat, zero g cholesterol, 2 g protein and 29 g carbohydrates. 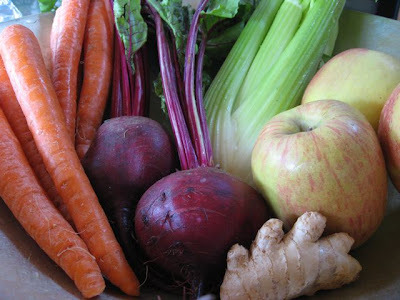 Fiber is removed in the juicing process. This simple salad can be used in many ways. You can use it to stuff a tomato (as shown), or stalks of celery, top a salad, or serve with crackers. If you’re not trying to eat all raw food, make a sandwich on whole grain bread, slices of avocado, tomato, sprouts and a little mustard. In the recipe, I carefully balanced the sunflower seeds and almonds (high in omega 6) and the flax seed oil (high in omega 3) to create a healthy 4:1 omega 6 to omega 3 ratio. 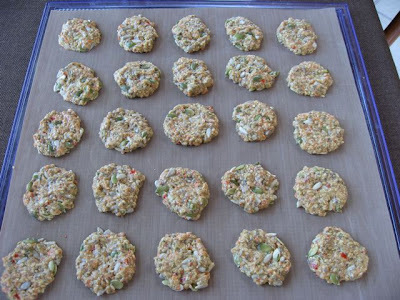 You will find that many of the raw food recipes use a large quantity of nuts. While very heart healthy, most nuts have much more omega 6 than omega 3 (in my previous post I stated that a good balance is 4:1 or less). Unfortunately, most raw food chefs aren’t aware of this. In fact, you will not find many raw food cookbooks that list any nutritional information at all. If you are just doing a 30 day raw food cleanse, it’s not that important. But, if you are a long term raw foodist, you should pay more attention to this as a proper balance will prevent potential health issues. So if you see me throwing in a tablespoon of cold pressed flaxseed oil here and there, you’ll know that I’m trying to get you a healthy combination of essential fatty acids. Don’t worry, it will still be delicious! With your knife slanted, cut into the top of the tomatoes at an angle, remove the stem and leave an indentation for the stuffing. Place each tomato on a small serving plate. Rinse the sunflower seeds and almonds and put them in a food processor with an S blade. Add flaxseed oil, lemon juice, lemon zest, Dulse flakes and half the sea salt and process until it forms the texture of canned tuna fish. Scrape down the sides as necessary. Put this mixture in a mixing bowl and stir in the celery, bell pepper, red onion and parsley. Add black pepper and the additional salt if needed. Stuff each tomato with the mixture and serve. Or, refrigerate the salad mixture (it actually tastes better if you allow some time for the flavors to meld) and serve it the next day. Per serving: 276 calories, 21.4 g fat, 1.7 g saturated fat, zero g cholesterol, 9.5 g protein, 16.2 g carbohydrates, 5.7 g fiber, 1.8 g omega 3 and 7.4 g omega 6. 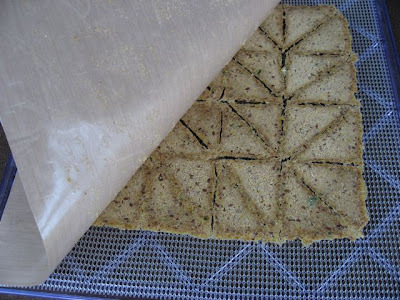 Crackers on a dehydrator sheet. For the past 3 weeks, we have been adding more and more raw food into our diets in preparation for next months raw food cleanse. By gradually substituting raw meals and snacks for cooked and perhaps processed ones, we have gotten ourselves used to eating less toxic and more fiber rich foods. By doing this gradually, cleansing and detoxification reactions will be minimized. So for the remainder of this month, let’s get prepared for our ONE MONTH RAW. You may ask why on earth we would go completely raw for an entire month. The answer is simple. It’s spring! You are cleaning your closets, weeding your yards, preparing your vegetable gardens, well, you get the point. This will be a month that you will relieve your body from expending energy on digestion as the enzymes in the raw food you eat will provide most of that function. That will allow your body to use that energy to heal and rebuild. • Sign up a few friends and family members to do this with you. 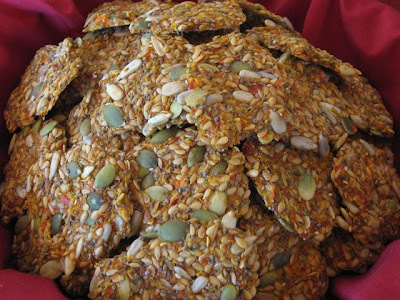 • Find a raw food potluck or meet up group in your area (try www.rawfoodmeetup.com or do a web search on “raw food potluck”. 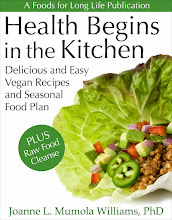 • Buy a raw food cook book—just look on Amazon, there are many to choose from. • Borrow or buy some raw food preparation tools like a Vita Mix or other high speed blender, a dehydrator, a juicer, sprouting jars, or a food processor. • Plan out a menu listing breakfast, lunch and dinner recipes—many raw food meals take time and must be planned. Raw food crackers can take a whole day, and sprouts can take a few days, so you need to think ahead or you’ll be living on salads and smoothies (not so bad). • List personal health goals that you want to achieve—for example, you may want to lose a few pounds, lower your cholesterol or stop taking allergy medication. Whatever it is, write it down. 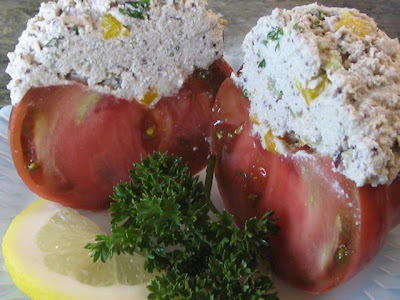 • Check out a local raw food restaurant or find a good vegetarian restaurant that offers a number or raw food options. If you are on meds or are undergoing chemotherapy, please discuss this cleanse with your doctor. Most allopathic doctors will just stare at you with a blank face, but give it a try. If nothing else, it may arouse their curiosity in healthy food—something they are definitely not exposed to in medical school. I asked my ophthalmologist this week if there was something I could eat or supplement with to help prevent cataracts. I had heard that bilberry, and certain carotenoids like lycopene, lutein and zeaxanthin were beneficial. He responded by saying that the human body wasn’t meant to live this long. Once you’re 50 or 60, you’re just going to get things like this. I never ceased to be amazed at the idiocy of the medical profession. I told him that I planned to live to 100 and I don’t plan on having my body fall apart well before that time! Today, I will give you a raw cracker recipe. I received good feedback on the raw corn chips I posted last week and I know that some of you are considering an investment in a dehydrator. So here is another recipe to entice you. 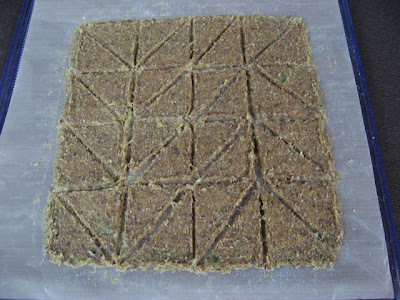 Raw crackers are a staple in any raw food diet. When you go completely raw, you tend to miss bread. Eating raw crackers seems to fill that urge. Also, when eating a salad or a raw soup, the crackers make the meal complete. These raw crackers are very high in the essential fatty acids used by the body to build omega 6 and omega 3 fatty acids. I can’t stress the importance of these nutrients enough. Omega 3 reduces inflammation and is very important for protection against cardiovascular disease, high blood pressure and some cancers. Only 7 of these crackers will provide everything you need per day. (Read more about these nutrients at the end of this post titled, “If you don’t eat fish, read this”). Combine the pumpkin and sunflower seeds in a bowl, cover with water and soak for 6 hours or overnight. Put the walnuts in a separate bowl, cover with water and soak for 6 hours or overnight. In a large mixing bowl, combine the flax and chia seeds with 1 3/4 cups of filtered water. Stir vigorously and let sit for 10 minutes. Stir occasionally for the first half hour. Then let soak for 4 or more hours. This will turn into a gelatinous mass. You will not be rinsing these. After the soaking time, rinse the pumpkin and sunflower seeds in a strainer and place in the large bowl with the flax and chia seeds. Rinse the walnuts and place in the food processor with the carrot, celery, zucchini, bell pepper, onion, garlic, lemon juice, and salt (or Nama Shoyu). Blend until smooth but don’t over process. You still want to see flecks of the vegetables. Add this mixture to the large bowl and mix well. Drop the mixture by teaspoonfuls onto the drying sheets of the dehydrator. This recipe should make about 85 crackers. Dry in the dehydrator at 105 to 115 degrees for 8 hours, flip, remove the drying sheet and dry for another 8 hours or until crisp. Serve with dips, salads, soups, raw nut butters or by themselves. Per cracker: 29 calories, 2.5 g fat, 1.1 g saturated fat, zero g cholesterol, 1 g protein, 1.4 g carbohydrates, .9 g fiber, .6 g Alpha-linolenic omega 3 fatty acid, 1 g omega 6 fatty acid. Why Do Raw Food Recipes Often Call For Soaking Nuts And Seeds? • Soaking removes their enzyme inhibitors, allowing them to begin germinating, increasing their vitality as well as their nutrient density. • Soaking and rinsing reduces their phytic acid content which inhibits the absorption of important minerals. • It also makes them more digestible. • There are 3 types of omega 3 fatty acids. Alpha-linolenic acid (ALA), eicosapentanenoic acid (EPA), and docosahexaenoic acid (DHA). EPA and DHA are thought to be the most beneficial. • Although many people get their requirements of EPA and DHA from fish or fish oil capsules, ALA omega 3 from sources like chia and flax seeds can be converted by the body into EPA and DHA. • The Vegetarian Society recommends 4 g of ALA omega 3 fatty acids per day in order to ensure that the body produces adequate amounts of EPA and DHA. • A proper balance of omega 6 to omega 3 is 4:1 or less. Most people eat a much higher ratio (almost 10:1) mostly because of the high use of corn and safflower oil. • This high balance interferes with the conversion process in the body of ALA to the more beneficial EPA and DHA. • These crackers have a less than 2:1 ratio. Seven crackers will provide the 4 g of ALA required to produce adequate amounts of EPA and DHA. • You can also get 4 g of ALA from 1/2 tablespoon of flaxseed oil or a full tablespoon of ground flaxseed. 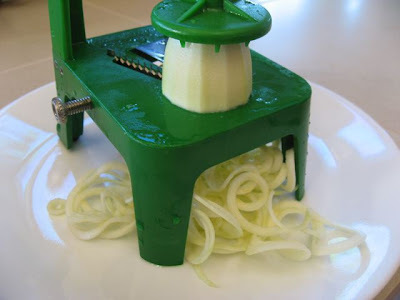 Making zucchini spaghetti on a Benriner spiral vegetable slicer. Vegan lemon basil pesto served as a dip. 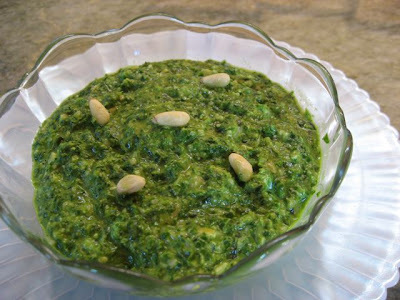 This pesto recipe makes a wonderful, light sauce that can be used as a topping for many dishes or it can be served as a dip. It is almost raw except for the nutritional yeast. But wait, before my raw foodist friends decide to delete this from the recipe, know that it has many nutritional benefits and should be a food staple for those on a vegan diet. Its natural nutty and cheesy flavor makes it a perfect substitute for the parmesan usually used in pesto recipes. If you eat cheese, please feel free to substitute back the parmesan and delete the nutritional yeast but before you do that, give it a try. I bet you won’t notice the difference. You can use nutritional yeast in any recipe that calls for parmesan. It is also a healthy topping for popcorn! It seems like every week I’m telling you about another kitchen toy used in raw cooking. To make what looks like “spaghetti” out of zucchini squash (to be used in our lemon basil pesto recipe), you will need a spiral vegetable slicer. The one I LOVE is the Benriner spiral vegetable slicer from Japan. We started out with a less expensive Saladacco spiral slicer but didn’t have much luck with it. Some people do get this one to work so I wouldn’t rule it out. Run the garlic through the chute of the food processor. Add the basil, lemon juice, lemon zest, salt and oil and process until smooth. Add pine nuts and nutritional yeast and process being careful not to over process the nuts. Set the pesto aside. Peel 4 medium zucchini, and put through a spiral vegetable slicer. Place the zucchini “spaghetti” on paper towels to dry. 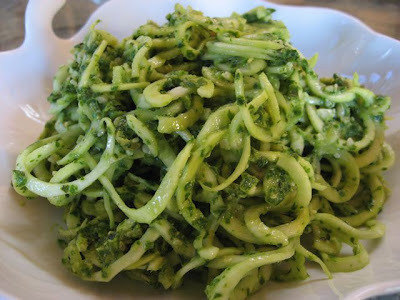 Put dried zucchini strands in a serving bowl, mix together with vegan lemon basil pesto and serve. Per serving: 210.4 calories, 19 g fat, 2.4 g saturated fat, zero g cholesterol, 5.6 g protein, 11.5 g carbohydrates, 3.2 grams of fiber. Lemon basil pesto may also be served as a dip or over cooked pasta. Vegan Coleslaw With Creamy Cashew Dressing—Hold The Mayo! Coleslaw is an American favorite side dish but unfortunately it is usually covered in high cholesterol mayonnaise making it less healthy than it could be and not an option for vegan consumption. Cabbage, the center piece of coleslaw, is a powerful cancer fighting cruciferous vegetable. Dressed in a delicious mixture of raw cashews, honey and unpasteurized apple cider vinegar, it makes a good raw vegan lunch dish. And of course, it’s also a wonderful side dish when eating grilled veggies, chicken or fish. If you are not already familiar with apple cider vinegar, this recipe will introduce you to an ingredient with many health benefits. For centuries, apple cider vinegar has been used to cure a long list of ailments including arthritis, acid reflux, high cholesterol – and the list goes on and on. Some claim that it breaks down fat and is used to lose weight. My personal experience with it was when I was suffering from severe reflux and I used it as part of a holistic regimen to get that under complete control. The one thing you must be sure of is that you buy “unpasteurized” apple cider vinegar. It looks cloudy and maybe even a bit brown. If it is clear, it’s the wrong stuff. You can use apple cider vinegar in any recipe that calls for vinegar as a much healthier alternative. Many people drink a few teaspoons a day mixed with a little honey. This coleslaw recipe provides 234% of your daily requirement of Vitamin A, 39% of Vitamin C, 62% of Vitamin K and 12% of Folate. It has zero grams of cholesterol and is very low in saturated fat. 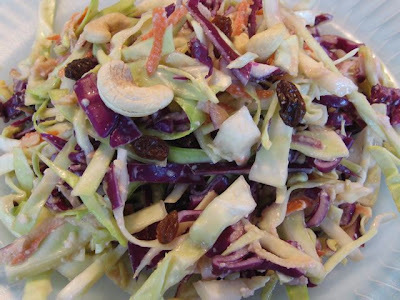 In a large bowl, combine the green and red cabbage, carrot, apple, onion and raisins. In a Vita Mix or other high speed blender, blend cashew pieces, water, apple cider vinegar and honey until smooth. Mix the dressing well with the cabbage mixture. Salt and pepper to taste and refrigerate for several hours. Mix again before serving. Garnish with additional cashews and raisins if you desire. 26.3 g carbohydrates, and 4.1 g of fiber. Corn mixture scored into 32 crackers on a Teflex sheet. Flipping the scored corn mixture over onto a mesh sheet and carefully peeling off the Teflex. 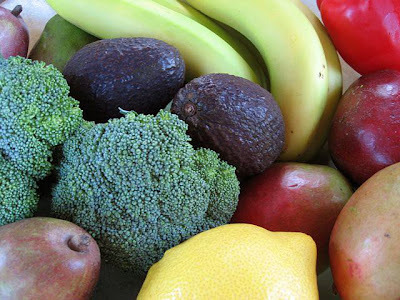 We are spending the month of April increasing our raw food intake so that we can go completely raw for the month of May as we do our “spring cleanse”. This week, we are eating at least one raw meal a day, all raw snacks and by weeks end, we should be consuming two raw meals a day. If you ever decide to go completely “raw”, you will probably find that you miss eating bread. Raw crackers and chips seem to fill that urge. Also, when eating a salad or a raw soup, these crackers and chips make the meal complete. In order to make crispy raw chips, crackers, pizza crusts, etc., you will need a dehydrator. Sounds like a big step, but you’ll be surprised how much you’ll use it. Besides making raw chips and crackers, I use it as an alternative to canning and freezing. When apples are in season or we have a big crop from our trees, we use it to dry apple slices. Too many tomatoes? Make sun-dried tomatoes without the sun. Bananas getting too ripe? Make banana chips. Buy too much basil or your basil plant in your garden is starting to bolt? Dry it for use in the winter. You can also dry fruits and vegetables and then throw them in the blender to make fruit and vegetable “powders” which make amazing seasonings. Need raw snacks? Make fruit leathers and trail mixes. Dehydrators are also used to make home-made yogurt. I bought a 5 drawer Excalibur with 5 Teflex sheets and 5 mesh sheets and it’s worked really well for me. 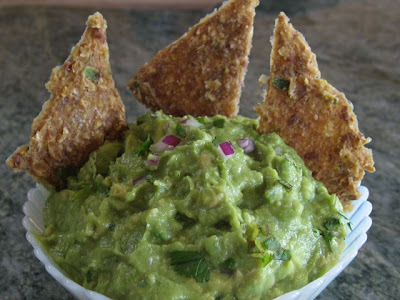 Guacamole and raw jalapeno corn chips is a great appetizer to serve for guests or to take to a potluck. Sometimes we just eat it for lunch! With a fork, mash avocados in a bowl until fairly smooth. Stir in the rest of the ingredients. If not serving immediately, place one of the avocado pits back in the guacamole and cover well with plastic wrap. Per serving: 116.5 calories, 10.5 g fat, 1.5 g saturated fat, zero g cholesterol, 1.5 g protein, 6.3 g carbohydrates, and 4.5 g of fiber. Run the jalapeno through the chute of a food processor and place chopped jalapeno in a large bowl. (Be careful as the jalapeno going through the food processor can give out some strong fumes which can make you cough). Add corn, walnuts, lime juice, sea salt and cumin to the food processor and blend until smooth. Add blended corn mixture to the large bowl. Add flax seeds and mix well. Divide the mixture in half and place each half on a Teflex sheet. Spread it out in a rectangle and score it into quarters, then score each quarter into quarters. Score each square into 2 triangles until you have 32 triangles on each Teflex sheet. Dehydrate at 110 degrees for 8 to 10 hours. Flip over onto a mesh sheet, peel off the Teflex sheet and dry on the mesh sheet for another 8 hours or until dry and crisp. Break each chip apart carefully and serve. Per 8 chip serving: 202.5 calories, 12.4 g fat, 0.9 g saturated fat, zero g cholesterol, 6.4 g protein, 21.9 g carbohydrates, and 4.5 g of fiber. A few years ago, my daughter took me to Quintessence, a raw food restaurant in east village. It’s a small restaurant, not nearly as elegant as Pure Food and Wine (one of my favs when in nyc). But in this tiny, modest little restaurant, I ate some of the most delicious raw food dishes I’d ever had, and it takes a lot to beat the gourmet raw food that my friends in the south bay bring to our potlucks. But the best dish I had was their chia pudding. That was the first time I had ever had chia pudding. Well, the next night we returned and I skipped dinner completely and went straight for the chia pudding. I asked, no begged, for the recipe. They wouldn’t budge. I even tried to bribe the wait staff. What was I to do? I was returning to California the next day and had no way to satisfy my newly acquired addiction! I immediately tried to duplicate it. I went through 3 pounds of chia seeds experimenting with different recipes. I’m not sure it’s as good as Quintessence, but it’s pretty darn close. 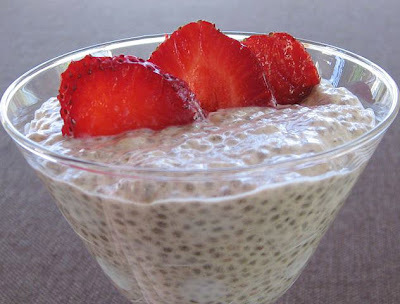 So here is my version of this amazing chia pudding recipe. Each serving has 2,425 mg of omega-3 and 1,882 mg of omega-6 essential fatty acids! An excellent non-fish source of omega-3’s needed during pregnancy. This dessert is high in fiber and also delivers a healthy serving of calcium and iron, two nutrients that are difficult to obtain in a raw food diet. Soak the cashews for at least 4 hours and rinse well. Put them in a high speed blender (like a Vita Mix), along with the dates, their 2 cups of soak water, the vanilla, and cinnamon and blend until smooth and creamy. In a 1 quart bowl, combine this mixture with the chia seeds. Stir vigorously with a fork for several minutes. Let it sit for 15 minutes and stir again until the chia seeds are well blended and no longer clump together. You can add a few drops of liquid stevia or add a bit more vanilla or cinnamon at this point if you desire. Once the mixture is well combined, put it in the refrigerator for at least 6 - 8 hours. If you want to serve this at dinner, make it early in the morning. Otherwise, make it the day before and leave it in the refrigerator overnight. Before serving, top with seasonal berries. Per serving: 164.5 calories, 10 g fat, 2 g saturated fat, zero g cholesterol, 4.5 g protein, 22.5 g carbohydrate, 7 g fiber, 2.4 g omega-3, 1.9 g omega-6, 2.9 mg iron and 93 mg of calcium. In week one, we replaced one meal a day with an all raw meal. This week, I’d like to add making all of our snacks raw. Substitute candy bars and potato chips with raw nuts, fruits, vegetable crudités with raw nut butters and raw smoothies. After a one month transition, we’ll do a 30 day ALL RAW cleanse. Make this salad one of your raw meals of the day. This makes a great lunch and you can serve it with raw crackers (I’ll show you how to make those soon). The most exciting thing about this recipe is the dressing. I love chia seeds. You will see them in a lot of my recipes. They are one of the healthiest foods on the planet. Yes, they are the same seeds that made those silly chia pets. But did you know that this high protein, high fiber food not only is an amazing source for our omega-3 and omega-6 essential fatty acids, they also have more than 5 times the calcium as milk! I’ve always struggled with making healthy salad dressings but I’ve finally discovered a way to thicken the dressing without oil or, god forbid, corn starch. Chia seeds absorb about 10 times its weight in water. If you mix it with water or any liquid, it will form a gel. So if you just put a tiny amount in the salad dressing (I only use one teaspoon in this recipe), it thickens it and makes a beautiful dressing with delicate little seeds. I also use these seeds in crackers, puddings and anything else I can think of. You can find them in health food stores or buy them online. Check out more of my chia seed recipes. Early in the day, put 1 teaspoon of chia seeds into 2 tablespoons of water. Let sit for several hours until it forms a gel. Then combine this chia gel with the cilantro, lime juice, olive oil, salt and pepper. 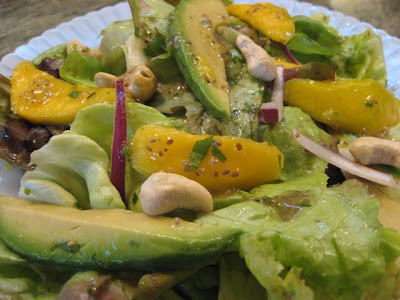 In a large bowl, combine the butter lettuce, mango, avocado and red onion. Dress the salad with the lime chia seed dressing. Serve on two large salad plates and garnish with cashews. Per serving: 240.7 calories, 18.9 g fat, 2.9 g saturated fat, zero g cholesterol, 4.9 g protein, 19.1 g carbohydrates, and 5.6 g fiber. Raw Food Diet—Is It Enough? I promised everyone that I would post my research on whether or not you can really get all the nutrition you need from a raw food diet. After reviewing my first detailed posting, my daughter immediately slipped into a deep coma. She begged me to “lighten this up” or I would lose everyone’s interest. I told her she didn’t understand my raw food friends and how SERIOUS these guys are about health. They eat durian for goodness sake. They do liver cleanses. They blend green weeds into their smoothies. They sprout, dehydrate, blend and soak all to achieve phenomenal health. Surely they would read 113 pages of data on raw food nutrition. OK, maybe not. Perhaps she’s right. So I’d better summarize this important albeit mind-numbing information. People need certain essential vitamins, minerals, amino acids and fatty acids to live. I took each one of these nutrients and evaluated whether or not it was even possible to get enough of them by eating a raw food vegan diet. I developed a scoring system and scored each nutrient. They were either, “adequate”, “moderate” or “inadequate”. 2. The number of servings it takes to meet the RDA or AI. The following is a list of “adequate” nutrients and the EASIEST to obtain from a raw food diet! The good news is there are MANY nutrients that are plentiful in raw food vegan diets! As I post raw recipes, I will point out the ones that help us get the more difficult, “moderate” nutrients. For example, the April 3rd recipe, “spicy not-tuna roll”, is a very good source of Vitamin E and iodine. But let’s talk a minute about Vitamins D and B12. Vitamin D is important in calcium metabolism and is required for healthy bones and teeth. Lately, there’s been a lot of press linking this vitamin to fighting MS, heart disease, osteoporosis, depression and even the big C. Even doctors, who generally trash talk anything “holistic” are even ordering blood tests to monitor vitamin D levels and prescribing it when they show to be insufficient. The RDA is 400 IU’s but many are now recommending 1,000 per day. What’s a raw foodist to do??? Vitamin D is produced by the body when you are exposed to the UV rays of the sun. (OMG, the sun?? Aren’t we covering our bodies in SPF 15 or more to prevent cancer? Now they are saying vitamin D can protect us from cancer?) But even if we weren’t afraid of the sun, few of us have the luxury of laying naked on the beaches of Hawaii every day. But those of you who are lucky enough to live in sunny places should make a point of getting out for 15 to 30 minutes a day. If the sun isn’t getting your vitamin D stores high enough, you might consider taking a supplement, drinking a fortified juice or soymilk or adding a bit of seafood to your diet. A single teaspoon of cod liver oil gives you 450 IU, more than the current RDA. You can get over 500 IU from a dozen raw oysters (to me, quite a bit more appetizing than downing cod liver oil!). Vitamin B12 cannot be synthesized by plants or animals. It’s produced by bacteria, algae and fungi. The reason you find it in meat is because animals ingest these microorganisms. Plants contaminated with B12 producing bacteria can be a source, but that’s not likely in developed countries. It was once thought, by the raw food community, that the bacteria in our intestines could produce enough B12 to maintain our health but that is no longer believed. Nor is it still believed that you can prevent deficiency from eating algae, miso, shitake mushrooms, spirulina, etc. It turns out that these foods contain vitamin B12 “analogs” which don’t count. (An analog is not biologically active and can actually block the absorption of vitamin B12). So famous raw foodists, like Gabriel Cousens, are now saying that EVERY vegan will eventually show B12 symptoms. Symptoms range from fatigue and confusion to serious issues like depression, psychosis, heart attack, and stroke. The problem is you may not notice this until it’s too late! First of all, the body can store B12 for a number of years so that will delay symptoms. Also, folate can mask B12 deficiency and raw food is full of this B vitamin. Bottom line, get your vitamin B12 from supplements or a teaspoon a day of Red Star nutritional yeast. Traditional sources of B12 are clams, organ meats, trout, and salmon. A raw food vegan diet can be a very healthy and cleansing diet. Although it easily provides most vitamins, minerals, essential amino acids and all essential fatty acids, it will take careful planning to get enough vitamin E and B2, calcium, iodine, iron, sodium, zinc and the amino acid, methionine. A raw food diet cannot provide adequate vitamin B12 or vitamin D. So if you take care to get vitamin B12 and D through other sources mentioned above, we can work on the other nutrients through good planning and delicious recipes! Filling the nori with nut paste, cucumber and avocado. Rolling with the bamboo sushi mat. Japanese cucumber and strawberry salad. 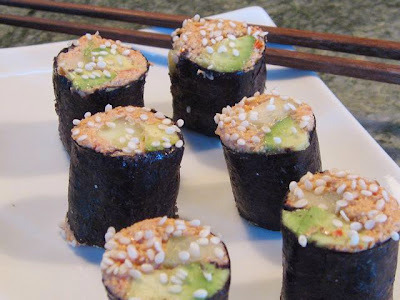 Today I will introduce vegan sushi as another recipe in your raw food repertoire. You can serve this for lunch or dinner. 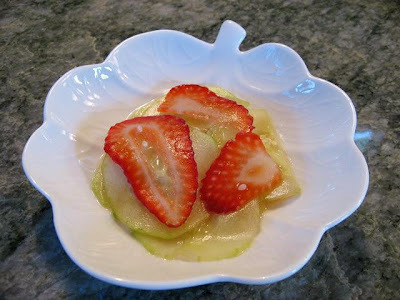 Along with it is a pleasant Japanese cucumber and strawberry salad. 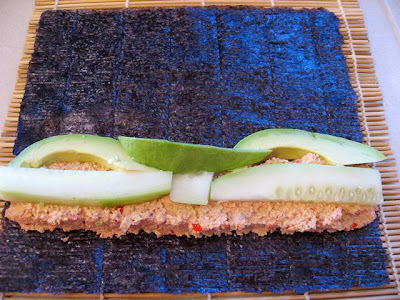 You’ll need a food processor with an S blade to make the spicy nut pate and a bamboo sushi mat to roll the sushi. Rinse soaked sunflower seeds and place in a food processor with the Dulse flakes, lemon juice, red bell pepper, salt and chipotle powder. Process into a paste. You will have to stop occasionally and scrape down the sides of the food processor bowl. If it seems too thick, add a little more lemon juice. In a small mixing bowl, combine the paste with the green onion. 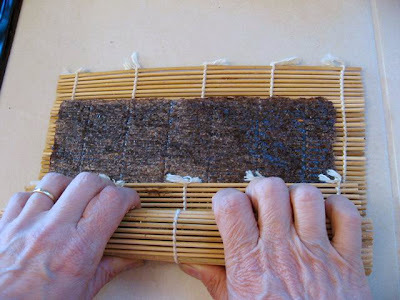 Place a sheet of Nori on a bamboo sushi mat with the precut lines arranged vertically. Put 1/4 of the nut paste across the sheet of Nori about 1 inch from the bottom. Arrange 1/4 of the avocado slices and 1/4 of the cucumber strips across the nut paste. Using the sushi mat, roll from the bottom up. After the bottom edge is over the filling, squeeze it gently with the mat and then roll to the top. Wet the top of the Nori and complete the roll. The moisture will seal it. Cut the roll with a very sharp knife into 8 pieces. Sprinkle the cut pieces with sesame seeds. This recipe makes four 8 piece rolls. Serve with Nama shoyu, which is raw, unpasteurized, soy sauce. Per 8 piece roll: 229 calories, 18.8 g fat, 1.9 g saturated fat, zero cholesterol, 7.2 g protein, 11.1g carbohydrates and 5.9 g of fiber. Sunflower seeds are a very good source of Vitamin E and the Dulse and Nori provide iodine. These two vitamins are moderately difficult to obtain in an exclusive raw food diet. Dry the cucumber slices with a paper towel. Dissolve sugar and salt in vinegar in a bowl. Add cucumbers, strawberries and sesame seeds and combine. Serve immediately in 4 small bowls. Per serving: 30.3 calories, 1 g fat, .3 g saturated fat, zero cholesterol, .5 g protein, 4 g carbohydrates and .3 g of fiber. Raw, living food is said to have many health benefits because of the living or “life force” within it. It is the living enzymes in the unaltered food that are said to be the cause of these benefits in that they assist the body in digestion. Ann Wigmore was an early proponent of eating raw and living foods after curing her own colon cancer with raw greens, seeds, and grains. 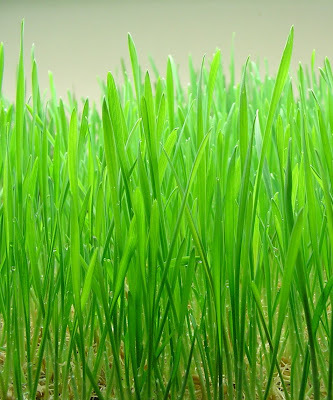 After spending many years healing people with raw wheatgrass juice and other living foods, she believed that preserving one’s enzymes was the secret to good health. Wigmore founded the Hippocrates health institute whose philosophy is “founded on the belief that a pure enzyme-rich diet, complemented by positive thinking and non-invasive therapies, are essential elements on the path to optimum health”. Dr. Edward Howell spent a lifetime researching the significance of the living enzymes in food and developed the “Food Enzyme Concept” which proposes that ingested enzymes result in significant digestion which reduces the amount of digestion required by the body. He also promotes the “Law of Adaptive Secretion” which claims that only the exact amount of digestive enzymes that are needed for a particular food, are produced by the body at the time of digestion. This is contrary to the belief, at that time, that an equal amount of all digestive enzymes are secreted by the body despite what food is ingested. This is known as the “Theory of Parallel Secretion.” The “Law of Adaptive Secretion,” according to Howell, is proof that living organisms try to conserve their enzymes or “living force” which he believes is limited and exhaustible. Many question whether or not enzymes in food can survive the digestive tract. A significant study which answers this question was done by Prochaska and Piekutowski in 1994. This study shows that the living enzymes ingested in raw food survive digestion and work synergistically with those in the digestive tract. This work also confirms Howell’s belief that the presence of food enzymes reduces the amount that the body must produce thereby allowing the body to “preserve” its digestive enzymes. According to Howell, these food enzymes are destroyed if heated to a temperature of 118 degrees F for more than one half of an hour. Howell explains that the stomach is compartmentalized into an upper part, where there is no peristaltic action and no excreted digestive enzymes, and a lower part, where hydrochloric acid and pepsin are secreted and protein digestion occurs. It is in the upper part of the stomach, the “food-enzyme stomach” where the pH is 5 to 6 and the food enzymes are actively digesting food along with the body’s own ptyalin and amylase from saliva. Cousens (2000), a modern proponent of the benefits of enzymes, feels that if more raw food were consumed, more digestion would occur in the upper “food- enzyme stomach” and the pancreas would be spared the effort of producing more digestive enzymes. Since these digestive enzymes also diminish significantly with age, raw food could contribute to digestive health and longevity. So why is this important and how does it contribute to the magic of a raw food diet? I have read that digestion can take as high as 80% of the energy you produce. That sounds high to me but even if it were half that, it’s a great deal of energy that the body could be using for healing and rebuilding. I will attest to the fact that when I am 100% raw, I sleep less and have a boundless energy. I remember visiting my son and his wife made us a lovely sautéed spinach dish on rice for lunch. It was the first cooked food I had eaten in 30 days. After the meal, I slept for 3 hours as my body had not needed to produce digestive enzymes in a month! Cousens, G. (2000). Conscious eating. Berkeley, CA: North Atlantic Books and Essene Vision Books. Howell, E. (1985). Enzyme nutrition; The food enzyme concept. New Jersey: Avery Publishing Group. Prochaska, L. J. & Piekutowski, W.V. (1994). On the synergistic effects of enzymes in food with enzymes in the human body. A literature survey and analytical report. Medical Hypotheses, 42(6), 355-362. Spring is here and Doug and I find ourselves cleaning out the garage and barn, cutting brush, weeding, trimming trees and getting our garden ready for summer vegetables. But the winter also puts a few pounds on our bodies and may gather toxins from the relative inactivity. So it’s also time to cleanse our bodies and get in shape for summer. Many people choose this time to fast. I’ve never been able to do that since I have low blood sugar. For me, an easier way to successfully cleanse my body is by eating more raw food. I discovered the “Raw Food Diet” a few years ago when I was looking for a topic for my Ph.D. dissertation in holistic nutrition. I chose to study the nutritional adequacy of a raw food vegan diet and in doing so I discovered a cleansing and healthy way to eat. In the winter when it’s cold, I must admit, I crave more cooked foods. Even then, I try to eat at least 25% raw food. But now, with spring upon us, I’ll increase my raw food intake significantly. By summer, when fresh fruits and vegetables are abundant, I will typically be eating at least 75% raw food. I also find that going 100% raw for a short period of time, like 30 days, is a great way to “spring clean”, get some extra energy, lose a few pounds and get focused. In the next few weeks, I’ll show you how to gradually transition to a raw food diet. Then you can decide if you want to go totally raw for 30 days or a life time! There has been much interest in this diet. From simple juice bars to high-end Manhattan restaurants like Pure Food and Wine, raw food restaurants are appearing all over the world. On the internet, I found 129 restaurants in 29 different states that featured raw food menus and over 100 regularly held raw food potlucks being held across the United States. Raw food retreats that combine seminars on nutrition and food preparation together with activities such as yoga and massage are being held in resort-like locations lasting from a few days to a week or more. More intense mind-body-spirit programs such as the three week program held at the Optimum Heath Institute in San Diego, California and Austin, Texas. Both include an organic, live, raw vegetarian diet as the cornerstone of their detoxification program. A similar program is offered in the Hippocrates Health Institute in West Palm Beach, Florida. This growing interest stems from the belief that eating a predominately raw food diet will lead to remarkable health and that more benefits are achieved as the percentage of raw food is increased. One hundred percent consumption is considered, by some purists, to be optimal. Countless testimonials have been shared that describe personal experiences from rapid and effortless weight loss, improved well being to the curing of serious diseases. I met a number of people in the raw food community who were able to lower their blood pressure and cholesterol, lose significant weight, totally control their type 2 diabetes without medication, and improve their general health. With real life success stories like these, there is little wonder why people have adopted this food regimen in hopes of obtaining similar results. On the surface, there would appear to be little downside to eating a wholesome and natural diet similar to what must have been consumed in prehistoric times before humans discovered fire. However, this nutritional lifestyle is highly restrictive and there has not been much data to determine the effects of a long term consumption of a raw food vegan diet. In fact, recent literature points to some serious health risks associated with this food regimen. It would be tragic if a person adopted this diet with the hopes of health improvement without understanding and compensating for any possible nutritional deficiencies. Throughout the next few months of postings, I will share the results of my research and show you how to make up for these deficiencies so that you can reap the benefits of a raw food diet while mitigating the risks. A raw food diet is composed of food that has not been heated above 118 degrees Fahrenheit or 48 degrees Centigrade. Some say this upper temperature should be as low as 105 degrees Fahrenheit but there is general consensus that at 118 degrees, the chemical nature of food changes and the living enzymes are denatured. Foods allowed are raw fruits, vegetables, nuts, seeds, beans and grains. Nuts and seeds are commonly pre-soaked or sprouted and used in nut and seed butters and cheeses as well as dehydrated crackers and granolas. Nut milks are the base ingredients in dishes such as smoothies, sauces, and raw desserts or are just consumed as a beverage. Grains and beans are also used in their soaked or sprouted form. Besides activating the live enzymes of the nuts, seeds, grains and beans, soaking and sprouting also inactivates much of their phytate content making them more digestible and their minerals more bioavailable. Grains are also used to make rejuvelac, a fermented, live beverage that promotes healthy intestinal flora. Although raw foodists are typically vegan, some eat raw dairy and even raw animal food. Although the percentage of raw food consumed varies, typically at least 75% of food is consumed raw and many feel that 100% is the optimum way to achieve the most benefits. Seaweeds, algae, grasses, and herbs are also consumed. Unheated fats and oils made from foods such as olives, coconuts, sesame, and flax seeds, are the raw foodists’ source of healthy fats and essential fatty acids. Raw honey, dried fruit, dates, or date sugar, and the herb stevia are used as sweeteners as well as Sucanat, an organic product made from unrefined, dehydrated whole cane sugar. Foods are allowed to be frozen but may not be chemically preserved. Most people who follow this diet prefer produce that is grown organically, without pesticides or chemical fertilizer. The main reasoning behind a raw food diet is that food in its raw state contains all of its enzymes that would otherwise get destroyed during the cooking process when exposed to temperatures above 118 degrees Fahrenheit. The exogenous enzymes found in uncooked food can work together with endogenous enzymes produced by the body itself to more efficiently digest food. In addition to the benefits of enzyme activity, raw foods are thought to have higher nutrient value than cooked foods and can also carry microorganisms and bacteria that may introduce beneficial flora to the digestive tract. Also, the alkaline nature of this diet allows a more optimal pH balance for the body. With a pure, alkalizing food regimen rich in enzymes, nutrients, and beneficial flora, the body is relieved in its duties of detoxification, heavy digestion and the neutralization of acidic foods. With the resulting extra energy, the body can devote itself to healing and cleansing. The claims are remarkable and plentiful which is why the seriously ill and those searching for longevity are flocking to this nutritional lifestyle. From looking younger, feeling more energy and clarity, requiring less sleep, having a better disposition, and shedding extra weight to curing serious disorders like fibromyalgia, Candida, migraine headaches, cancer, diabetes, digestive disorders, hypoglycemia, arthritis, chronic fatigue, back pain, and depression, the claims are tempting enough to plunge into this food regimen without necessarily understanding if it could provide adequate nutrition. So it is important to understand how to avoid some of the pitfalls of this diet. Start Transitioning To a Raw Food Diet Today! 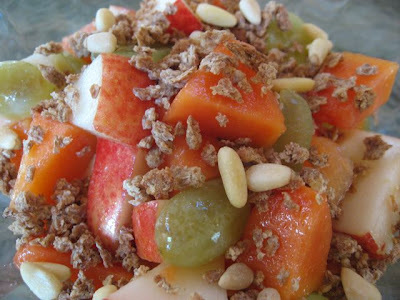 Mix the fruit and pine nuts and top with Ezekiel sprouted cereal. Per serving: 363.5 calories, 10 g fat, .75 g saturated fat, 8 g protein, 67.5 g carbohydrates, and 10.5 g of fiber. This salad is high in fiber, Vitamins A, C, K and folate. * There is some debate about the temperature at which the Ezekiel cereals are baked and whether or not they are really “raw”. They do claim that their “exclusive slow baking techniques help preserve the living food”.